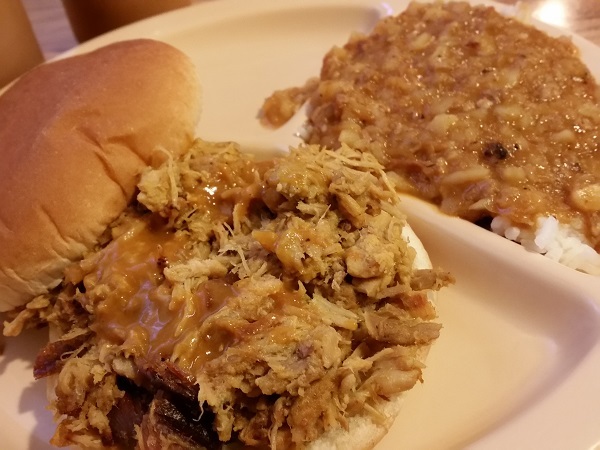 Dennis’ Bar-B-Q, Hephzibah GA – Marie, Let's Eat! A few chapters ago, as I started this series about our trip to South Carolina, I noted that very few of us in the blogging hobby have written much about Augusta. It’s kind of odd, really. Augusta has been in a tug-of-war with Columbus for as long as I can remember about which is the second-biggest city in the state. Wikipedia tells us that as of 2012, Augusta is the third-largest city, but the second-largest metro area, so neener neener, Muscogee County. I kid, but seriously, the region is badly, badly underrepresented in our hobby, which is why my friend Keith’s thread about the area on roadfood.com is so welcome. Making matters much worse – and I’ll have more to say on this in a story next week – is that Zomato’s purchase of Urbanspoon, and subsequent destruction of all that was good about it, has left writers like me with no freaking idea what has been covered in a town like we used to have. As far as I am aware, blog posts about Augusta-area restaurants have always been thin on the ground, usually from people roadtripping to and from like we did on this trip. But since Zomato destroyed the old blog leaderboards that we loved so much, I couldn’t do what I wanted to on a trip like this. I knew that I’d be back in the area for a late supper, and wanted to see what all had been written about the barbecue available in the area, and perhaps make a choice from that. Zomato deleted what used to be the very best resource for the kind of planning that I enjoy the most. 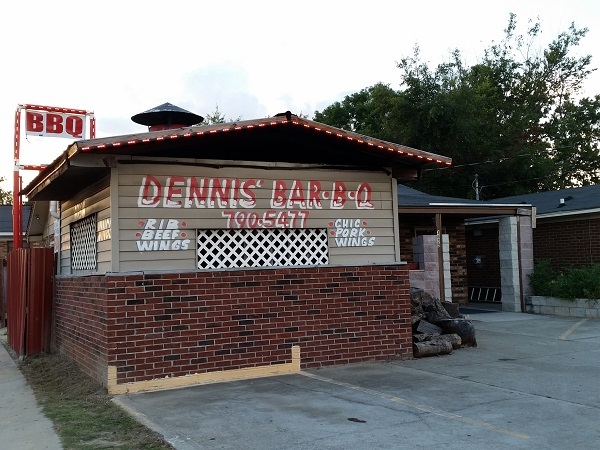 So I went back to square one and found Dennis’ Bar-B-Q in Hephzibah with a general search for barbecue in the Augusta area, without looking through several other writers’ work first. But I did at least get to mention to Keith that I was planning to stop here and he said I was sure to enjoy it. They smoke in a cinderblock pit attached to the building, and a few years ago, some other outlet with a propane-and-wood steel smoker set up shop and couldn’t dent the locals’ love for Dennis’. The girlchild and I arrived not long before the sun went down. The restaurant’s in a converted house and most of their business is carry-out. Service is what we might call unhurried. Not extraordinarily friendly, either, to be honest, but they do the job for their neighborhood, with barbecue and wings and a drinks cooler. After a surprisingly long wait, I enjoyed a very good sandwich with a side of hash and rice. The meat is very smoky, a little dry, and is enhanced by some of the mustard-based sauce. The regular sauce is fairly standard for the region. The hot sauce is unbelievably hot and might could cause hallucinations. Use it sparingly! As for how it stacks up regionally, I enjoyed it more than I did Sconyers, which is the area’s aging heavyweight, although not quite as much as I did the BBQ Barn in North Augusta SC. Unfortunately, I learned next to nothing about this restaurant. The employees kept to themselves in the pit room, emerging at the ring of a counter bell or at the chirp of the telephone to prep a carry-out order. Other than a smiling and playful caution that the hot sauce “may be too hot for anybody today,” I didn’t get to speak with anyone after placing our order. I suppose I’ll have to stop by some other time and try again if I’d like to learn a little more about the business. The hash was very good; I wouldn’t object to another visit at all, but I’d also like to sample some more barbecue in the area. We made good time coming home, and rejoined Marie, who was finishing up another batch of jam, around 11 pm. That was a very good day trip. Posted on September 21, 2015 August 23, 2017 by Grant G.Posted in augusta, barbecue, georgiaTagged augusta, barbecue, georgia, hash and rice, hephzibah. Dennis BBQ would enjoy another visit from you. It might be a while before we’re back in the Augusta area, but we might swing by for some more of the hot sauce. Thanks for writing! Pingback: Harry and Larry’s Bar-B-Que, Winter Garden FL – Marie, Let's Eat!